Provide comfort for the family of Harmon HAMMITT with a meaningful gesture of sympathy. 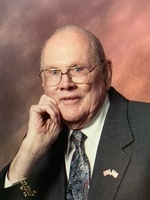 Harmon Hammitt, 95, a resident of Beaver, OK., passed away on March 15, 2019. He was married to the love of his life, Edna, for 66 years. He was born on May 7, 1923 in Grand Junction, CO. He met Edna when his family moved to Woodland Park, CO in 1936. He joined the Navy on December 7, 1941 and did his basic training in Farragut, Idaho. In 1942 he was stationed at Pearl Harbor as a medic. After his discharge, he returned to Woodland Park and married Edna on May 2, 1946. In 1960, the family moved to Colorado Springs where he lived until 2016. He was preceded in death by wife, Edna; son, Lawrence Hammitt; granddaughter, Jacqueline Aragon; and great granddaughter Dominque Aragon. He is survived by his two daughters, Sandra McClain and Penny Jones (Ron); sister, Grace Gilmore; daughter-in-law, Margie Hammitt; 7 grandchildren, 14 great-grandchildren, 3 great-great-grandchildren; and several nieces and nephews. Memorial service will be held at 11:00 a.m., March 29,2019 at Pikes Peak United Methodist Church, 2927 West Pikes Peak Ave., Colorado Springs, CO.
To send flowers in memory of Harmon HAMMITT, please visit our Heartfelt Sympathies Store. We encourage you to share your most beloved memories of Harmon here, so that the family and other loved ones can always see it. You can upload cherished photographs, or share your favorite stories, and can even comment on those shared by others. Provide comfort for the family of Harmon HAMMITT by sending flowers.